As we move into the twenty-first century the most important question for businesses everywhere is: What are we going to do about the Internet? The two most qualified people in the country to answer that question may be Al Ries and Laura Ries. Not only are they the authors of the BusinessWeek bestseller The 22 Immutable Laws of Branding, they are also consultants to dozens of Fortune 500 companies.… This book is the result of their hands-on work with both large and small companies as well as Internet start-ups and established Internet brands. Brash, bold, and mercifully succinct, The 11 Immutable Laws of Internet Branding is the definitive text for businesses eager to jump on the Internet expressway.In the book you'll learn why:The Internet can be a business or a medium for your brand, but not both.Interactivity is the single most important ingredient of any Internet site.The kiss of death for an Internet brand is a common name.Being second in a category is tantamount to being nowhere.You have to be fast. You have to be first. 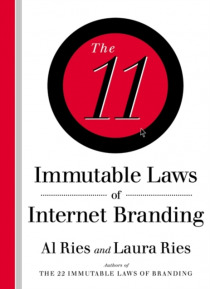 You have to be focused.Everyone is talking about convergence while just the opposite is happening.The 11 Immutable Laws of Internet Branding will also give you tangible information on how to successfully build your company, product, service, or self into a hot and profitable brand on the Internet. Specifically you'll learn how to:Build a brand that will dominate a category over an extended period of time.Find a proper name (instead of a common one) for your Website.Take your brand into the global marketplace.Avoid the biggest mistake in Internet branding: the belief that you can do everything.Take advantage of the transformations that will occur in all aspects of life, thanks to the power of the Internet.With characteristic counterculture observations and signature marketing savvy, Ries and Ries bring their expertise to branding on the Internet, the most challenging problem in the world of marketing today. No one who wants to turn a brand into a global phenomenon should ignore their sage advice.